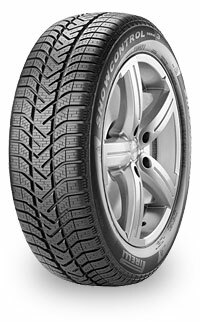 Designed for the cirty car or medium sized saloons or hatchbacks, the Pirelli Winter 210 Snowcontrol series 3 is part of the incredibly poular winter line up of tyres from the Italian tyre giant. The 210 Snowcontrol series is a wintertyre designed to offer maximum traction and grip on snow and ice covered roads. A directional arrow tread design aims to offer supreme levels of comfort and handling without any negative effects on the perfomance of the tyre. The increased silica content in the tyres compound ensures that it remains durable in colder conditions and grip / traction is uncomprimised. A new tread pattern has also lead to further spacing between the tread blocks in order to minimise the external noise and further add to the comfort of driving.